This is straight up honey and milk. Super duper nice when you need something different. A nice milky base with a sweet touch of honey. This one is a steeper, 3 weeks minimum, a month is best! 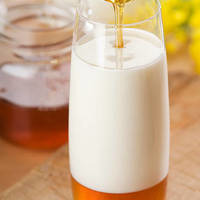 Delicious honey milk. Love it! Well worth the wait! I wish I had made more than 60ml. When you dropped this recipe I was already on the fence about buying FLV milk & honey so this pushed me over the edge, grabbing FA honey on my way and man I'm glad I did. Right away I mixed up 120ml's because if I was gonna steep it for 3 weeks I didn't want to blow through a 30ml right away then have to steep more so I was counting on you for a banger, and you didn't let me down. This is a perfect summer time vape. It's creamy and milky with just enough sweetness. It doesn't get cloying or sickeningly sweet if you toss it in a tank and spend your day in the summer heat like a lot of heavy cream recipes can get. The honey is just enough to sweeten everything without taking away from the smooth dairy and vanilla. Totally worth the steep time and ordering flavors just to mix this up, way to go man!